It feels a-mazing to be chilling out this Sunday vs. running errands, wrapping presents, cooking for a crowd, chasing around for school supplies, cleaning up the house, grocery shopping, or getting on a plane. I didn’t plan for it to be this way, but I am relaxing, and ahhh what a wonderful concept. 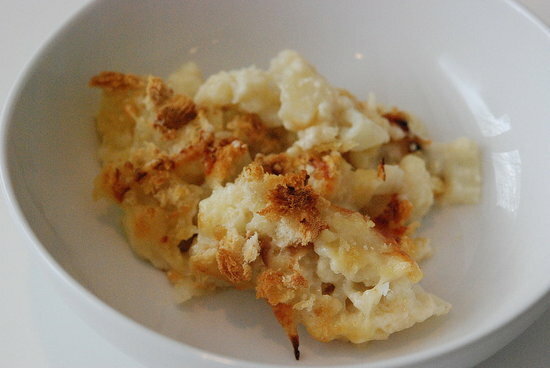 Not sitting still (which is what I should be doing), but doing fun things, like working on my blog name change and making a simple cauliflower gratin, a recipe I saw on The Wednesday Chef a few days ago and decided that I must make. I knew that I had all the ingredients in the cooler, not to mention the must-have champagne to go along with preparing and consuming it, so around 11:30 this morning I dug in. 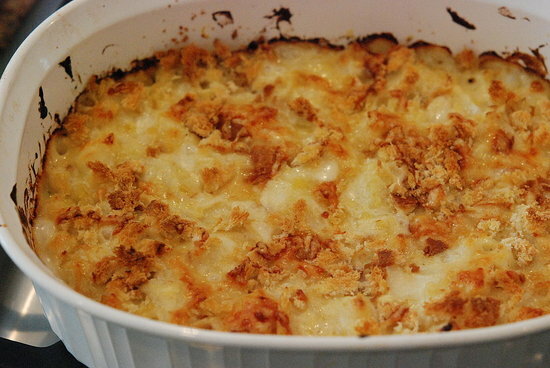 The gratin is lovely, lovely and easy too. 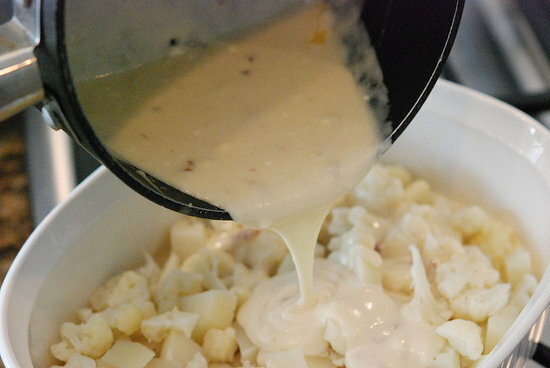 The only thing I think I’d change is to skip the potatoes and go all cauliflower – it ends up so sweet and delicious, and is such a perfect foil for gruyere cheese, that I found myself a little bummed each time I got a bite of potato instead of cauliflower (it’s hard to tell as you spoon it up, given white vs. white in white sauce). Most definitely don’t skimp on salt. And I admit, I kept wishing for a kiss of garlic as well, although it’s certainly not necessary. Perhaps I can’t shake the image of MFK Fisher’s cauliflower gratin (which I tried a few times, but gave up because the cream and cheese do not “come together in a perfect sauce” with 21st century not-French cream and gruyere – definitely go with this recipe and consider the aforementioned tweaks). Anyhow, lightly cheesy cauliflower underneath a crusty topping is about the best Sunday afternoon lunch/brunch I could imagine. « Fresh Tart, Fresh Start?